Mario Theissen, the head of BMW Motorsport is to propose to the BMW board of directors that the Munich company increase its investment in F1 and buy control of the Sauber team. The Swiss team is owned by the banking house Credit Suisse but Peter Sauber retains all the voting shares of the team, which means that he makes the decisions. Credit Suisse bought the shares five years ago after Red Bull boss Dietrich Mateschitz decided to cease his involvement with the team as an owner, following a dispute over whether the team should hire Kimi Raikkonen (Sauber's choice) or Enrique Bernoldi (Mateschitz's choice). The bank has enjoyed a lot of exposure for relatively little investment and might be willing to sell its shares despite the fact that the value of the F1 teams is at a low ebb at the moment because of the political uncertainty in the sport. In banking logic it is better to take what one can rather than risk a loss in the future. Convincing Sauber to sell control of the team may not be a huge task, particularly if the deal means that he stays on in some titular role and enjoys motor racing without the responsibilities of being the team boss. Sauber is 61 and, while not really thinking of retirement, he might like an easier role. Theissen would be the new team principal, a role he clearly relishes. Convincing the board of BMW will be another matter. 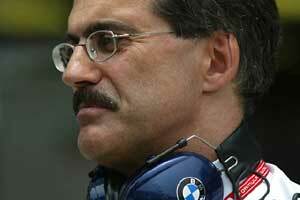 BMW is disappointed with results that have been achieved with Williams in the last five years. Both sides must take some of the blame for that. The problem for Theissen is that having direct control will not necessarily guarantee better results, even if the team is run by Bavarian supermen. Sauber has had Ferrari engines for years but has yet to come close to the performance of the Italian team. Building up the team would require sizeable investment and would take time and during that phase of development there would be no guarantees of any big results. Theissen's logic, according to our spies, is to stay with Williams as well, until Sauber is a success. This may sound like a wonderful idea for the men in Munich but it is hardly a vote of confidence in Williams and it is logical that in such a situation Williams would be on the lookout for an alternative engine partner with a little more faith. And if that happened BMW could end up with egg on its face. As we understand it, the fallback plan would be for BMW to remain a simple engine supplier and provide engines for Sauber and Williams, a situation which would pitch the two teams against one another and would make progress through open competition. A similar situation occurred with Renault back in the 1990s and Williams ultimately emerged ahead of rival Benetton after a year of Michael Schumacher-inspired success for the Enstone team in 1995. Without Michael, Benetton was trounced by Williams in 1996 and 1997. The big question that needs to be answered in all of this is whether or not BMW is willing to risk a massive investment at a time when there is no certainty about the future of F1. Something will ultimately emerge from the current political mess but it is a big risk to commit hundreds of millions of dollars when the shape of the future is less than clear.